The Treaty of Guadalupe Hidalgo, also known as the "Mexican Cession," brought an official end to the Mexican-American War (1846–48) and was signed on February 2, 1848, at Guadalupe Hidalgo-- the city to which the Mexican government had fled because of the advance of U.S. forces. According to its terms, Mexico ceded fifty-five percent (525,000 square miles) of its territory, including all or portions of the present-day U.S. states of Arizona, California, New Mexico, Texas, Colorado, Nevada, Wyoming, and Utah, to the United States. (Right) The map shows the vast territory ceded by Mexico in the Treaty of Guadalupe Hidalgo in 1848 and in the Gadsden Purchase of 1853. It further indicates the immense territory previously claimed by the Republic of Texas. By simultaneously annexing and granting statehood to Texas on December 29, 1845, the United States had intentionally provoked Mexico, a nation that had never recognized the existence of the Republic of Texas, to war. After Texas entered into the Union as the 28th state, a state of war would exist between Mexico and the United States in merely 117 days, resulting in the Treaty of Guadalupe Hidalgo, the largest land acquisition (including Texas) in the history of the United States. The Treaty of Guadalupe Hidalgo was signed by Mexico and the United States on February 2, 1848, amended and ratified by the U.S. Senate on March 10, 1848, ratified by the President of the United States on March 16, 1848, and with ratifications exchanged at Queretaro, Mexico, on May 30, 1848, and proclaimed on July 4, 1848. Mexican officials and Nicholas Trist, President Polk's representative, began discussions for a peace treaty in August 1847. Its provisions called for Mexico to cede 55% of its territory, which included present-day Arizona, California, New Mexico, and parts of Colorado, Nevada, Utah, and Wyoming in exchange for fifteen million dollars in compensation for war-related damage to Mexican property. 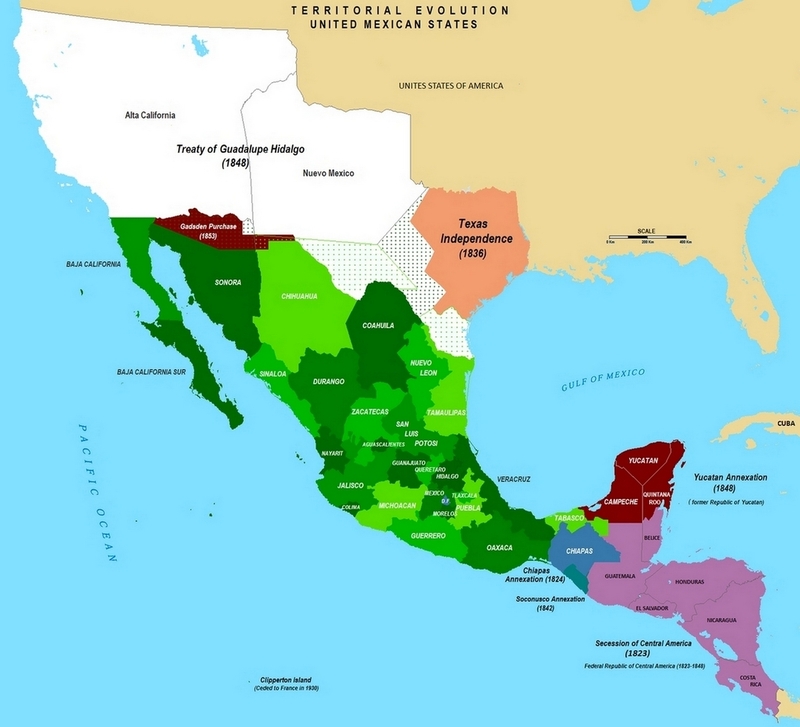 The Treaty of Guadalupe Hidalgo forced Mexico to recognize Texas and its boundaries. In addition, it established the Rio Grande as the border between the two countries. With the defeat of its army and the fall of the capital, Mexico City, in September 1847, the Mexican government surrendered to the United States and entered into negotiations to end the war. The peace talks were negotiated by Nicholas Trist, chief clerk of the State Department, who had accompanied General Winfield Scott as a diplomat and President Polk's representative. Trist and General Scott, after two previous unsuccessful attempts to negotiate a treaty with President Antonio López de Santa Anna (aka President Santa Anna), determined that the only way to deal with Mexico was as a conquered enemy. Nicholas Trist negotiated with a special commission representing the collapsed government led by Don Bernardo Couto, Don Miguel Atristain, and Don Luis Gonzaga Cuevas. President Polk had recalled Trist under the belief that negotiations would be carried out with a Mexican delegation in Washington. In the six weeks it took to deliver Polk's message, Trist had received word that the Mexican government had named its special commission to negotiate. Trist determined that Washington did not understand the situation in Mexico and negotiated the peace treaty in defiance of the President. In a December 4, 1847, letter to his wife, he wrote, "Knowing it to be the very last chance and impressed with the dreadful consequences to our country which cannot fail to attend the loss of that chance, I decided today at noon to attempt to make a treaty; the decision is altogether my own." Trist was uncompromising in his belief that justice could be served only by Mexico's full surrender, including surrender of territory. Ignoring the president's recall command with the full knowledge that his defiance would cost him his career, Trist chose to adhere to his own principles and negotiate a treaty in violation of his instructions. His stand made him briefly a very controversial figure in the United States. Under the terms of the treaty negotiated by Trist, Mexico ceded to the United States Upper California and New Mexico. This was known as the Mexican Cession and included present-day Arizona and New Mexico and parts of Utah, Nevada, and Colorado . Mexico relinquished all claims to Texas and recognized the Rio Grande as the southern boundary with the United States. The United States paid Mexico $15,000,000 "in consideration of the extension acquired by the boundaries of the United States" and agreed to pay American citizens debts owed to them by the Mexican government. Other provisions included protection of property and civil rights of Mexican nationals living within the new boundaries of the United States, the promise of the United States to police its boundaries and compulsory arbitration of future disputes between the two countries. Trist sent a copy to Washington by the fastest means available, forcing Polk to decide whether or not to repudiate the highly satisfactory handiwork of his discredited subordinate. Polk chose to forward the treaty to the Senate. When the Senate reluctantly ratified the treaty by a vote of 34 to 14 on March 10, 1848, it deleted Article X guaranteeing the protection of Mexican land grants. Following the ratification, U.S. troops were removed from the Mexican capital. Once the Mexican Cession was signed, 55% of the vast territory of Mexico was signed over to the United States, thus extending the borders of the U.S. from sea to shining sea. It also removed from its doorsteps the footprints of the global powers of England, France, and Spain henceforth. Until the Mexican Cession in 1848, the lands that now formed the United States had long been a struggle between many nations that had once staked their claims of ownership. As a result of the Battle of the Alamo and the Texas War of Independence, Mexico would soon succumb to political discord, civil strife, and finally civil war. Following the Mexican War, Mexico was burdened with staggering debt, the loss of 55% of its territory, and a collapsed economy. France would even make a grand effort to conquer what it referred to as a weakened Mexico in 1862, only to be repulsed at the Battle of Puebla on May 5, 1862, by a much smaller, yet determined Mexican force. To commemorate the Mexican victory, it is celebrated annually as Cinco de Mayo. The United States too would pay a hefty price because of its acquisition of Mexican territory. With the Mexican Cession in 1848, formally the Treaty of Guadalupe Hidalgo, the nation purchased territory that forms the present-day U.S. states of California, Nevada, Utah, most of Arizona, about half of New Mexico, about a quarter of Colorado, and a small section of Wyoming. The Treaty also forced Mexico to officially recognize Texas and its boundaries. Until 1850 the nation had hosted 15 free and 15 slave states, creating a balance between proslavery and free states. When California was admitted to the Union as a free state in 1850, the United States soon added three additional free states with Minnesota in 1858, Oregon in 1859, and Kansas in 1861. The nation was now confronted with an imbalance of power and influence between slave and free states, known as sectionalism, which served only to fuel existing tensions between the North and South. The Mexican Cession of 1848 resulted in the Compromise of 1850 and a rapid shift in political power and influence that favored the North. While the Compromise of 1850 fanned the flames of sectionalism, in just eleven years, 1861, the nation would be engaged in bloody Civil War. Sources: Library of Congress, National Archives, U.S. State Department, National Park Service, Memoirs of U.S. Grant.